Listening to this today I forgot how many amazing singles the Jam released. It seems like every one of them is a mini classic, from one of my favourites, News of the World (go Foxton) to Beat Surrender (Weller couldn’t wait to start the Style Council, he started it with this single). After listening to this I think The Jam really were a singles band, they never made an album to match. I still think A Town Called Malice is perhaps one of the best pop singles to ever get to No. 1, great tune and razor-sharp lyrics. Hidden gem; Funeral Pyre, a real overlooked gem. Probably the ‘the perfect compilation’ (only other contender being The Buzzcocks ‘Singles Going Steady’). Prime collection of singles, B-Sides and selected album tracks. 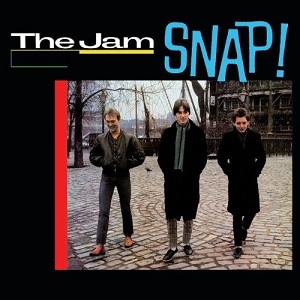 In a 5 year career, The Jam released 9 singles which weren’t on any album. Snap collects them in one handy package. And lets not forget the B-Sides, which in many cases were as good as the A-Side. There is another worthy compilation, albeit a little shorter, up for the title of “The Perfect Compilation”, and that would be 45 and Under, by Squeeze. This one, and Singles Going Steady, are ACE. Excellent posts-Buzzcocks and Squeeze are both great comps-your right too the Jam never quite made that great album although I do love “All Mod Cons” there are still fillers in there.